I first visited the Chartroom in the late 1970’s in my father’s Pearson 35. As sailing day trips go, this was about the right distance for a 5 knot sail from Peases Point. The reach over was always smooth and often idyllic. The upwind beat home was always work and no matter how hard we tried, we could never get past Bird Island without tacking. 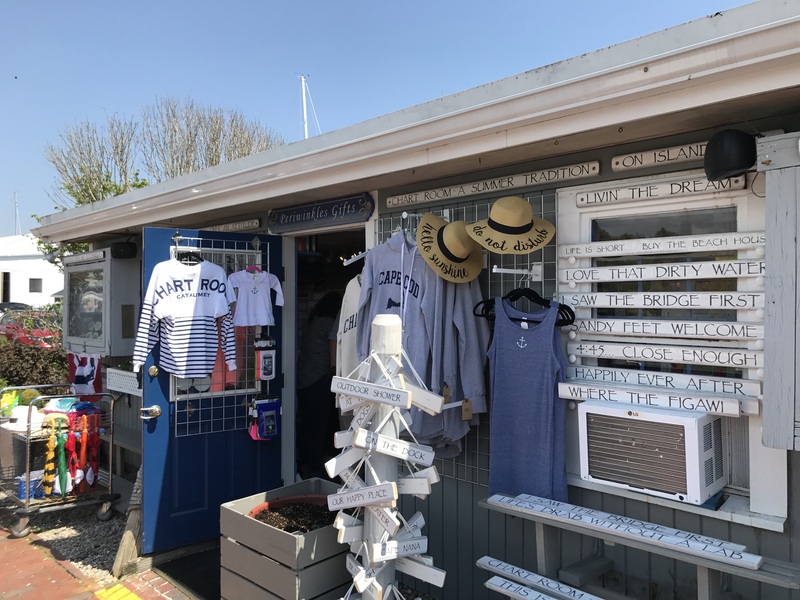 The Chartroom is perhaps the perfect iconic Cape Cod seaside dive and one of the most popular Dock and Dine venues on Buzzards Bay. There is no air conditioning, in fact no windows on the porch. There is also no frialator – so forget ordering fried clams. Back in the 70’s, they’d hand you a plate of frozen ice cream bon-bons with the bill. Sadly, those days are gone, but other than that, the menu barely changed until 2016. The top pick is the Lobster Salad on Portuguese bread. Their most popular lunch wasn’t even on the menu until last season. If you wanted one, you’d order a tomato stuffed lobster salad, hold the tomato, and add the bread! My go to lunch is a shared order of soft shell steamed clams and a Rueben. You get a choice of potato salad, cole slaw, or chips with any sandwich and I usually cop out for a bag of gourment chips. While the food is authentic home made fare, the cocktails are “killer”! Another Chartroom icon is their Mudslide. Unlike many girlie Mudslides that are cut with vanilla ice cream, the Chartroom’s are 100% liquor and blended ice. The recipe is simple – Bailey’s, Kahlua, and Vodka! Always a ladies favorite that often results a damsel in distress after one too many! One of the things that makes the Chartroom such a great destination is it’s association with Kingman Marine – click here for the details on getting in and out of Kingman. As mentioned earlier, one of the most appealing things about The Chartroom is that you don’t need calm winds for a perfect day. Sunshine is always good and although you can sit inside where it’s always warm and dry, the place to be is on the porch making this a summer spot. I like to get a spot at one of the finger piers so I try to arrive before noon on weekend days. You can hail Kingman on channel 71 and they’ll immediately tell you if they still have room at one of the piers. If not, they’ll assign you one of their moorings which isn’t too bad, just make sure to ask where the mooring is. It’s a crowded harbor and the letters on the moorings are to read! If you do end up on a mooring, don’t fret. They have a very nice fleet of first class launches constantly ferrying folks back and forth. 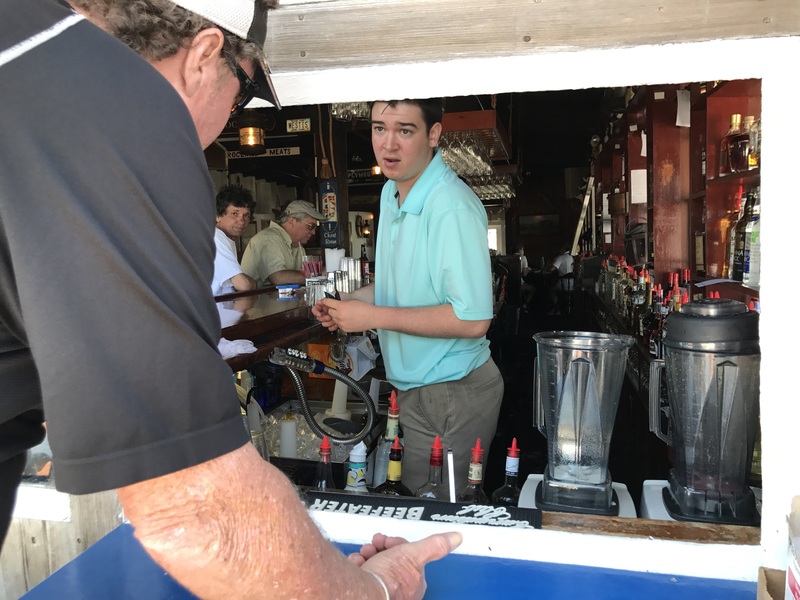 Once on shore, I make a beeline for the host table and get my name on the list for the porch. Often they’ll tell me “we can seat you right now”, but that’s not the way to craft a perfect day! You’ll want to negotiate a 30-40 minute delay so you can enjoy the outside bar and Adirondack chairs. Unless the porch is almost full, I’ve found that they’re happy to come and find you when there’s only one table left. Don’t waste time at the Chartroom Bar — just shout your order through the side window! Back outside, you’ll find a window bar next to the entrance and a very funky array of odd chairs, tables, and even a few umbrellas overlooking Red Brook Harbor. For many people, this is “My Happy Place”. This a great spot to just take in the day, enjoy some conversation, an adult beverage, or even smoke — just watch out for the wind blowing your smoke into someone who doesn’t appreciate it. As I mentioned earlier, once in the dining room, you’ll enjoy an authentic Cape Cod lunch bathed in the warm breezes of Buzzards Bay. After lunch, it’s worth a quick pass through the eclectic gift store next door – Periwinkles. Here you’ll find Chartroom hats and shirts along with other beachy things. One of the best ways to visit to day at the Chartroom is to drop an anchor behind Bassetts and enjoy the day. This anchorage is well protected in almost any wind direction and could be the most popular boating hang out in Buzzards Bay.